5.3l L59 GM engine, 4l65e transmission, new everything! 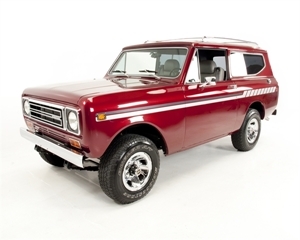 The owner of this 1977 Scout II approached us about doing some work to his truck. It included floor and rocker replacement, paint and bodywork, etc...but rapidly expanded to the point of being a frame off. We stripped it to the bare chassis, sprayed imron on the chassis, replaced calipers, rotors, hoses, lines, turned the drums, changed axle lube, replaced bushings, etc. The 304 was a little worse for wear, so we ended up finding a 5.3l engine/transmission from a 2006 Suburban, and we installed it. The body was gone over with a fine toothed comb and sprayed with a nice pearl maroon. Inside, the seats from a Tahoe were installed to give the owner 3-point seatbelts, and the door panels and back seat were recovered to match. This was all put on top of new black carpet and lots of sound killer for a nice, quiet, comfortable ride. We installed new tinted glass, power windows and locks, keyless entry, remote start, etc. Underneath the tub is a spray-in bedliner from front to rear, new poly gas tank, new fuel lines, exhaust, etc. This is a new truck, with a classic Scout body wrapped around it! It was not a quick project, nor was it an inexpensive one for the owner...but the results speak for themselves! There was a lot more work that went into this one than we can talk about here, or show pictures of, but you get the idea. Click the link below for lots more pictures and info on this build.